This week news broke that Citigroup will be the latest entry in the growing list of financial companies to receive huge infusions of federal tax dollars. But the bank is used to having money of others to keep it warm at night. As colleague Phil Mattera notes in Dirt Diggers Digest, the Fed’s guarantee of over $300 billion in Citigroup assets, along with a $20 billion direct cash infusion, demonstrates only the most recent example of the company’s tendency to get into trouble that requires a bailout. Add Uncle Sam to the list of 19th century tycoon John Jacob Astor, a modern Saudi Prince, and the government of Abu Dhabi, who have all previously provided financial aid. But Citigroup’s search for outside assistance has happened in good times as well as bad. Even when the company was raking in billions in profits, it relentlessly sought, and often received, state and local tax breaks without providing any benefits in return. Last year, Good Jobs New York and New Jersey Policy Perspective released a report examining Citigroup’s systematic use of relocation threats to play localities against one another so the bank could extract hundreds of millions in state and local subsidies. In Pay or We (Might) Go: How Citigroup Games the States and Cities, we examined Citigroup subsidies in New York and New Jersey, Kentucky and Texas between 1989 and 2007, and discovered the company benefited from almost $300 million in public funds in those four states alone. In virtually every move Citigroup made, it sought taxpayer help in footing its bill, often by threatening to move jobs elsewhere. So what then did these localities get in return for its investment in Citigroup? Here’s a telling example: Two years after the company (then Citicorp) received $90 million in New York City subsidies for its tower in Queens, it eliminated 500 jobs. And a few years after that, it decided to move hundreds of its New York City employees to Hillsborough County in Florida. New York will be hit (hard) again when the company lays off 52,000 jobs globally. Yet Citi is still trying to bolster its image by maintaining its $400 million plan to purchase naming rights for the new Mets “Citi Field” stadium. Considering Citigroup’s demand for public money without providing benefits, there may be extra reason to worry about the returns federal taxpayers will see from their unprecedented investment. Skimming the Sales Tax, a new report from Good Jobs First, shines a light on a little known aspect of state tax policy: the practice in about half the states of compensating retailers for collecting sales taxes on behalf of state and local governments. This is called by a variety of names such as vendor discounts and collection allowances. We use the term retailer compensation, but we also refer to it as a legal form of skimming. These programs, often unfamiliar even to tax experts, turn out to cost the states involved more than $1 billion a year. Much of the money is going into the pockets of giant retailers such as Wal-Mart. At a time when nearly all states and cities are experiencing fiscal distress, this diversion of taxpayer revenue should be a matter of public concern. 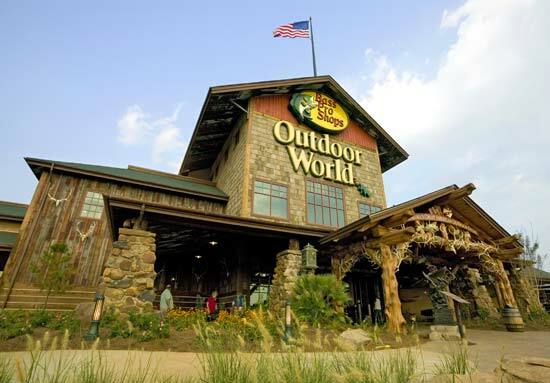 Twenty-six states provide some form of retailer compensation. Nineteen states and the District of Columbia do not. Five states don’t have a state sales tax. 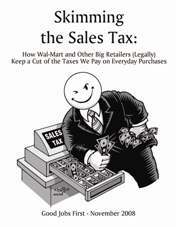 In all 26 states the compensation is calculated as a percentage of the sales tax collected by a company. Half of the 26 states put a ceiling on the amount a given retailer can receive, though the ceilings vary widely—from less than $1,000 a year in states such as Florida and New York to as much as $10,000 or more. The highest ceiling by far is in Michigan, where it can go up to $240,000 a year. But perhaps the bigger problem is in the 13 states that put no ceiling on what a retailer can receive. These states can end up giving away quite a bit of money. We found the largest loss in Illinois at $126 million. Second was Texas at $89 million followed by Pennsylvania at $72 million and Colorado at $68 million. States do not disclose how much is given to individual retailers, but we were able to estimate how much is being received by the country’s largest retailer—Wal-Mart. Using state-by-state figures disclosed by Wal-Mart on its sales tax collections, we estimate that the company is receiving a total of $60 million from the 26 states. In Missouri, for instance, we estimate that Wal-Mart is receiving about $10 million, or about 25 percent of all the retailer compensation paid by the state. Soon retailer compensation may be an issue even in the states that don’t currently provide it. There’s a movement among states to adopt streamlined sales tax policies as part of an effort to get online and mail-order retailers to collect tax on their sales. Pending federal legislation that would authorize states to collect taxes on interstate transactions would also require them to provide “reasonable” compensation to retailers for all their sales (though there is a small business exception). It would be left up to each state to decide what the compensation should be. The report also looks at another way local governments give up sales tax revenues. This occurs when they uses sales tax receipts as a form of economic development subsidy, such as when they allow large retailers to keep millions of dollars in taxes generated by a new store. There are no national figures available on this practice, but we document a loss of $130 million over the past decade in projects involving Wal-Mart alone. Finally, we offer some policy options to state and local officials. As for retailer compensation, we urge those states that allow the payments to review their programs. We especially urge states without ceilings to consider adopting them. As for subsidies, we note that retail incentives encourage sprawl and overbuilding, and we urge officials to avoid those subsidies except in those limited instances where they are the only way to bring essential retail services such as groceries and drugstores to underserved areas. With the election of a new president, officials in many states are hoping a renewed federal/state partnership will jumpstart the troubled economy. Until the new president takes office, however, falling revenues have prompted some states to take actions that are counter-productive rather than counter-cyclical. States are in a tough spot. For example, Illinois officials predict a revenue hole this fiscal year of $800 million or more. The Center for Budget and Policy Priorities (CBPP) projects state budget shortfalls across the nation will total $100 billion in fiscal year 2010. New York Governor David Paterson has just proposed school and health care funding cuts of $3.2 billion over two years, similar to those that have already occured in other states. But CBPP economist Nicholas Johnson argues cutting services and income supports makes the economy contract even more as the purchasing power of struggling families falls. Johnson cites the work of noted economists Joseph Stiglitz and Peter Orzag. They argue tax increases, by reducing savings and not just consumption, are less harmful to a depressed economy, especially when they fall mainly on wealthier taxpayers. While some states have enacted such tax increases or closed loopholes, others have instead considered tax cuts. Yet tax cuts are the least effective way to stimulate state economies in a recession. They can lead to further spending cuts while reducing the buying power of public employees. Fortunately, voters in several states have recently rejected the tax cut mantra. States would be better off strengthening consumer demand by extending unemployment insurance, preserving healthcare coverage, preventing foreclosures, and speeding up already scheduled public works projects. The federal government could help by providing grants, paying a larger share of Medicaid costs, and rescinding (or actually funding) burdensome, federally-imposed unfunded mandates that cost states nearly $34 billion in the last fiscal year. States can help themselves by better tracking, targeting or terminating largely unmonitored business incentives and tax giveaways like Single Sales Factor. They could adopt comprehensive unified economic development budgets (UDB), like the excellent UDB proposed for Kentucky. While more federal support is needed, states can use the recession to make their own economic development spending less wasteful and more productive. The Bush Administration is coming to a close, but it’s not asleep. With eyebrow-raising timing, the Internal Revenue Service (IRS) recently proposed changes, that would lessen the public approval and transparency requirements states and localities have to follow when they issue tax-exempt bonds for economic development projects. Cutting back these so-called “TEFRA requirements” would diminish the ability of community groups, labor unions, tax & budget advocates and individual taxpayers to question the use of tax-exempt bonds. Good Jobs New York has successfully used the TEFRA process to expose the questionable labor practices of some proposed bond recipients and to highlight inequitable and irresponsible proposals – like using post-9/11 Liberty Bonds for luxury housing, and issuing tax-free bonds to build the new Yankee and Mets Stadiums. 1) Decrease from two weeks to one the amount of time the public has to research a project and prepare testimony in support or opposition. 2) Allow localities to proceed with no hearing at all if there are no “timely requests” to participate. 3) Limit the information now made publicly available prior to a hearing by allowing for more general project descriptions. Before the IRS can change the TEFRA public approval process, it is itself subject to a public approval process. You can tell the IRS not to diminish your community’s voice by submitting testimony before December 8, 2008. There will be a hearing at the IRS on January 26, 2009, but you’ve got to submit written comments first. More information about the proposed changes and how to comment are HERE. Good Jobs New York encourages you to contact us with any questions or to let us know if you are interested in submitting comments. 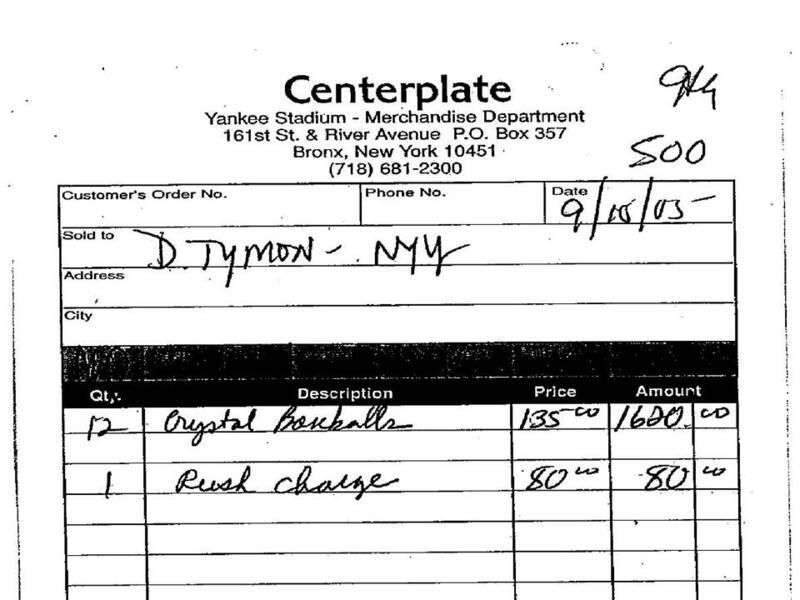 Today, New York City taxpayers finally got some Bronx cheer after an investigation by the office of City Comptroller William Thompson sent an $11 million tab to the New York Yankees. A little over a year ago, Good Jobs New York’s staff hunkered down at the office of the New York City Department of Parks and Recreation with Field of Schemes’ co-author Neil deMause to sift through boxes of receipts submitted by the Yankees as part of an agreement started under former Mayor Giuliani that permits the team to deduct “planning expenses” for the new stadium from the rent it pays to the city. The findings were extraordinary: receipts for gifts of crystal baseballs, steak dinners, bar tabs, baseball caps, “gifts for Japan” and one of my favorites, a $76 bill for shipping batting helmets to Tropicana Field in Florida. We urged Comptroller Thompson to conduct an audit of these expenses which we thought was long overdue. Thompson’s office came through. After reviewing documents submitted between 2003 and 2006 the auditors found several blunders akin to crystal baseballs including receipts for: $34,328 in travel expenses to other stadiums, donating $50,000 to a Political Action Committee and $359,617 in bonuses to the staff of the stadium’s developer. The Comptroller also found $1.8 million in overstated deductions for MLB revenue sharing as the team used a method not agreed to in the lease. And in what could be considered the definition of chutzpah, the team submitted receipts for 2006 expenses, even though the city let them to take two years worth of the annual $5 million credits in 2005. The Yankees have so far paid the city $7 million along with $600,000 in interest. A little more than $4 million is still due by March 2009. Considering the news of a possible “headcount reduction” at the NYPD and higher taxes on the city’s middle class, let’s hope the Yankees don’t take six years to pay the rest of the rent. In Massachusetts, ballot Question 1 proposed a total elimination of the state’s personal income tax beginning in January 2010. Massachusetts state income tax provides $12 billion in annual revenues (40% of the state’s budget), and its elimination would have decimated funding for public education, public safety personnel, crucial infrastructure repairs, and health care for low and fixed income residents. A report by the Massachusetts Taxpayers Foundation stated that passage of the initiative would have required the state to slash 70% of most state agencies’ operating budgets. The measure was decisively defeated with 70% of voters in opposition and just 30% supporting. Oregonians defeated Measure 59, intended to create an unlimited state income tax deduction for federal income taxes on residents’ individual income-tax returns. The initiative would have reduced Oregon’s tax revenues by $1.3 billion in 2011, with increasing reductions in the future. Defend Oregon, the measure’s primary opposition organization, estimated that 75% of Oregon residents would have seen state income tax reductions of less than a dollar, while the wealthiest 1% of Oregonians would have seen the greatest benefits. Measure 59 was defeated 63% to 37%. In North Dakota, Measure 2 proposed a 15% reduction in corporate income tax and up to 50% rate reductions in most individual income tax brackets. North Dakota already has the lowest individual income tax in the nation (of the states that tax personal income), and the measure would have provided less than one dollar of tax relief for families earning less than $25,000 a year. North Dakotans voted Measure 2 down by 70% to 30%. 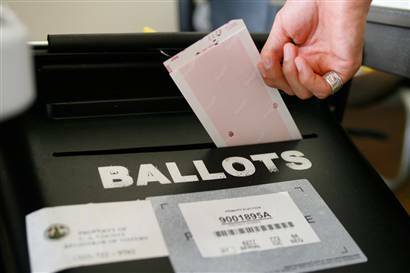 Labor won two major victories in Colorado with the defeat of two ballot initiatives. Constitutional Amendment 47, the “Colorado Right to Work Initiative,” which would have prohibited unions and employers from negotiating union shop contracts under which employees are required to pay union membership or agency fees as a condition of continued employment. The second measure, Constitutional Amendment 49, “Limitation on Public Payroll Deductions,” was created to prevent automatic deductions of union dues (dues check off) from public employees’ paychecks. The amendment would have accomplished this by prohibiting all public payroll deductions directed to private organizations. A local ballot initiative whose defeat we’re disappointed to report is Austin, Texas’s Proposition 2, known as Stop Domain Subsidies. The charter amendment proposed first that Austin halt its payment of a $63 million subsidy to a luxury shopping mall developed in north Austin, and second, that the city outlaw the provision of subsidies to all new retail development. The charter amendment was widely supported by small and local businesses, which more often than not are harmed by new subsidized retail development. Proposition 2 lost by a narrow 4% margin—48% to 52%. Have other local results to report? Please let us know in the comments section.